Up to 3,000 elderly people will not be able to get beds in UK care homes by the end of next year, research suggests. Research commissioned by BBC Radio 4's You and Yours programme reveals a huge shortfall in the number of beds available. Increasing demand from an ageing population could see that grow to more than 70,000 beds in nine years' time. 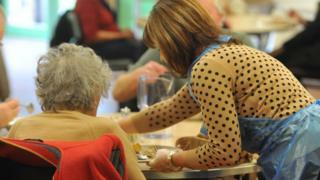 The Department of Health said local authorities in England had been given an extra £2bn to help fund social care. But in the past three years one in 20 UK care home beds has closed, and research suggests not enough are being added to fill the gap. The research, carried out by property consultants JLL, found that since 2002 an average of 7,000 new care home beds had opened in the UK every year, but by 2026 there would be an additional 14,000 people needing residential care home places per year. Lead researcher James Kingdom said: "We're currently building half the number of care home beds every year that we need." "There are more people living longer. "We know that over the course of the next decade there is going to be 2.5 million more over-65s, and as a result that means there is going to be demand for care home beds. "To fix that, we need to double the rate of delivery". Barchester Health Care is the third largest care home provider in the UK. It is concerned the gap in capacity means extremely vulnerable people are not getting the care they need. Chief executive Pete Calveley told You and Yours: "Increasingly, highly dependent people are left at home. "We feel that leaves them socially isolated and doesn't meet their needs. "So, one of the ways they reduce demand is by raising the criteria, which I don't think is always appropriate." But the Association of Directors of Adult Social Services says there is a risk too many people are being placed in residential care. The association's president, Glen Garrod, said: "There is a danger of looking to residential options when we haven't fully exhausted all those that might help people stay at home - which is where most people would prefer to be." In the past three years, 21,500 care beds have closed in the UK. People in the care industry worry that as bed capacity decreases and demand increases, there will be more pressure on NHS beds as elderly people are admitted to hospital because they can't cope at home. The government estimates this already costs the NHS in England £900m a year. Pete Calveley, from Barchester Health Care, said it was an increasing feature of the health and social care environment because there was not enough capacity in the community. The Department of Health said high quality care was not just about providing care home beds. A Department of Health official said 61% of people "are cared for in their own home, and since 2010 there has been a growth in home care agencies of more than 2,900". "We've given local authorities in England an extra £2bn boost over the next three years to maintain access for our growing ageing population and to put the social care sector on a sustainable footing for the future."